The Auberge le Grillon is the perfect place for either a short or a long stay and an ideal place to relax. We have five tastefully decorated double rooms, each with its own individual personal touch. The rooms are very cosy with en-suite shower and toilet. 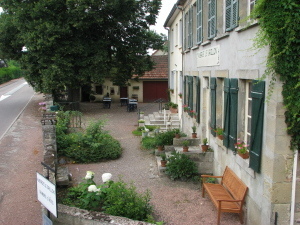 Sully is a small peaceful village in the French countryside, situated in South Burgundy between Beaune and Autun. The leafy Auberge gardens are arranged so that you can always find a nice place to sit, either in the sun or in the shade. In the vicinity of the Auberge lie many possibilities for a day out. You will find castles, churches, monasteries, beautiful museums and the historical interesting cities of Dijon, Beaune and nearby Autun with its Gallo-Roman remains and city gates. Well worth a visit are the many markets in the neighbourhood, the cosy terraces, the wine region around Beaune which starts only 15 minutes away and the hills of the Morvan National Parc to the west. There are many opportunities for walking and cycling. We have a lot of brochures from which you can select the perfect route. At the end of the afternoon when you come home from a nice day out, you can enjoy our three course menu prepared from Burgundian regional products. You can of course select the perfect Burgundy wine to accompany your meal from our wine list. We hope to welcome you here soon! Some places worth visiting are: The castle of Sully (you can go there by foot) Autun with its cathedral an gallo-roman remains Beaune with its famous hospice and the wine region The historic center of Dijon The Morvan natural parc Other possible activities are: walking, cycling, golf, archery etc. Follow the D973 from Beaune to Autun. Go to the right at the D26, direction Sully. In the village stay on the main road; the auberge is on your right. If you drive from Autun in the direction of Beaune, you can take the D326 (left) in the direction of Sully. At the end of this road you can see the auberge.